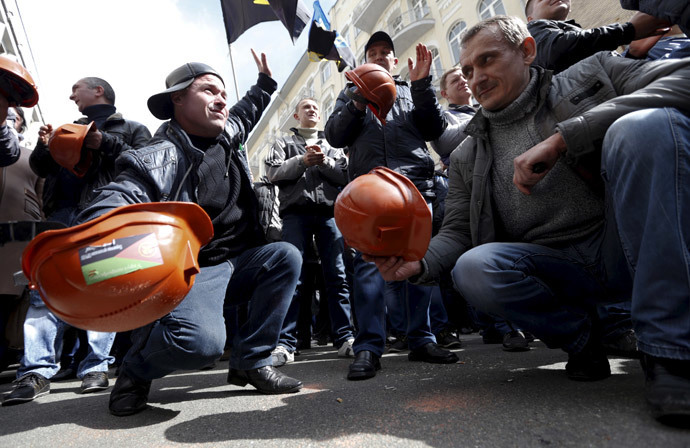 Thousands of coal miners from eastern Ukraine have taken to the streets in capital Kiev, protesting the closure of coal mines and demanding salary debts repaired. The protesters also wanted to talk to the PM, but Arseny Yatsenyuk ignored the call. The rally began in front of the parliament building and the presidential administration Wednesday morning, with a group of miners managing to break inside the administration. But the talks with the representatives of the authorities brought no result and the protesters relocated to the government headquarters, blocking the traffic at central Kreschatik Street. 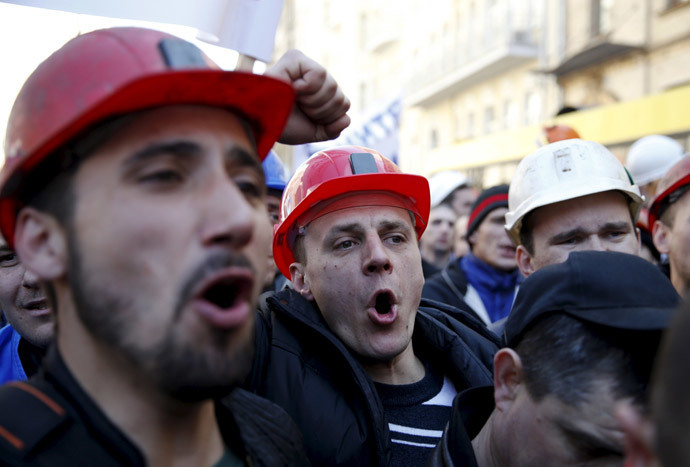 The miner’s unions said that 5,000 people took part in the protest, TASS reported. They also demanded that Coal Industry Minister Vladimir Demchishina, who recently announced plans to close three unprofitable mines, be removed from his position. “We come from a small mining town in Donbass [eastern Ukraine]. There’s no other work there, except for the mine. If it closes – our town will die out,” a wife of one of the miners complained. The government headquarters was protected by several cordons of police, wearing riot gear and carrying shields. However, there were no incidents reported between the demonstrators and security forces. The miners wanted to discuss the situation directly with Yatsenyuk, but neither the PM nor any of his ministers went out to talk to the people. After several hours the majority of the people dispersed, but 150 miners remaining near the government HQ declared an “infinite protest,” TASS reported. They said that they won’t leave until the authorities comply with their demands and retract of the decision to close the mines. Meanwhile, the administration of Ukrainian President Petro Poroshenko said it expects “effective actions” from the government in addressing the problems, which forced the miners out into the streets. “The basic concept of the coal industry reform, which is now under consideration, focuses on ensuring the operations of high-potential mines instead of providing funds for the repayment of wage debts. The issue of closure or conservation of unprofitable mines will be considered, but with the understanding of the necessity of providing social safety nets,” Vitaly Kovalchuk, first deputy head of the presidential administration, is cited by Interfax-Ukraine. The miners held all-Ukrainian Congress in Kiev on Tuesday, with 800 delegates coming up with a set of measures required from the government to save the country’s coal mining industry. They included Demchishin’s removal, changes to the country’s budget and a special meeting of Ukraine National Security Council. 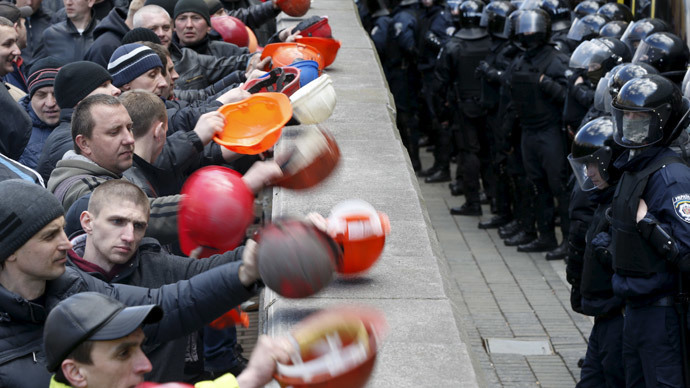 The miners promised to organize nation-wide strikes if their demands are ignored by the Ukrainian authorities. Earlier, the coal industry minister said that three unattractive mines in eastern Ukraine will be closed in order to relocate the resources on development of more lucrative projects. According to Demchishin, the Kiev authorities currently control 35 out of 95 coal mines in Ukraine. The majority of the mines are located in the areas held by the militias of the self-declared People’s Republics of Donetsk and Lugansk. A violent conflict began in Ukraine last April, with Kiev sending its military to the country’s eastern region after they refused to recognize the new coup imposed authorities in the capital.